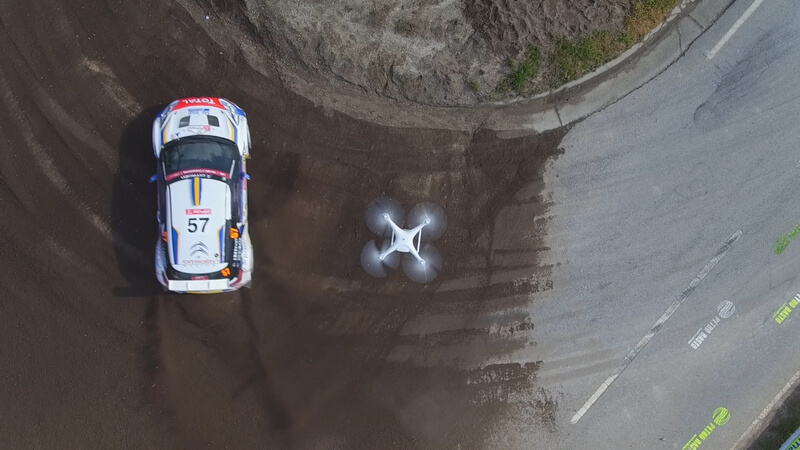 Starting with Rallye Monte Carlo this past January, DJI has been working closely with the World Rally Championship (WRC) in a partnership that aims to bring a completely new perspective of the world’s most prestigious rally championship to fans around the world. With the DJI Inspire 1 Pro, we are able to capture long, dynamic aerial shots that are impossible to create with handheld cameras or helicopters. With Rally Portugal, we reached a very important milestone: live broadcasting aerial footage from our Inspire 1 Pro to viewers via WRC+. It was also the first time we experimented with a new format, called DJI Aerial Analysis, captured with our new and smarter than ever Phantom 4. This format provides an in-depth look into how the drivers approach each individual stage: how they handle hairpin turns, their angle of attack, when they break and when they choose to preserve speed. In turn this gives drivers the insights they need to push performance to the next level. Footage is captured by utilizing the Phantom 4’s improved hover accuracy and the Waypoints Intelligent Flight Mode. Waypoints are used to map out exactly where the Phantom 4 needs to be so that we can return to the same spot in between shots, while stable hovering makes it possible for different images to be meshed together accurately. 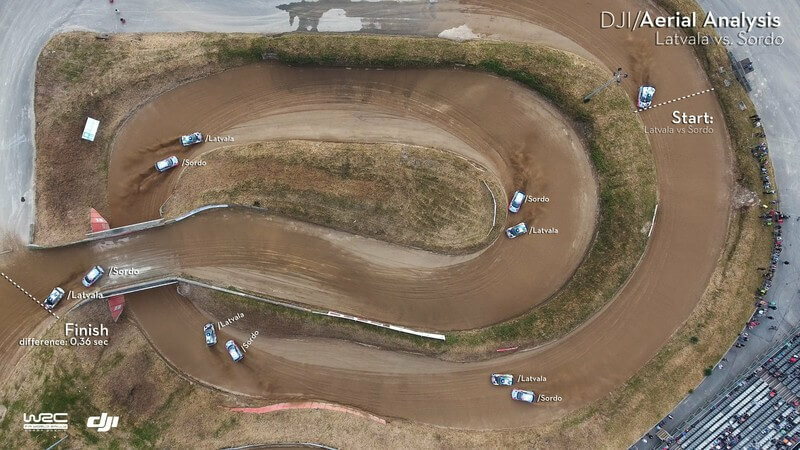 This shows the power of our Aerial Analysis: illuminating the small differences that are imperceptible to the naked eye and hold the answer to how Latvala came out of the turn 0.36 seconds ahead of Sordo. We see that Latvala took the first and second curves much tighter. This type of corner handling is faster but comes with high risk and therefore requires immense skill – a mistake here might mean coming to a stop or spinning out, risking the loss of position. “Looking at the final analysis image, it’s easy to see the potential of this project. Not only for bringing viewers greater insight into the rally, but also for the teams themselves to be able to improve their performance. With competition as intense as it is and the margins that make a win or a loss incredibly small, this analysis can help drivers look back at their performance and bring what they learn from it to the next round. 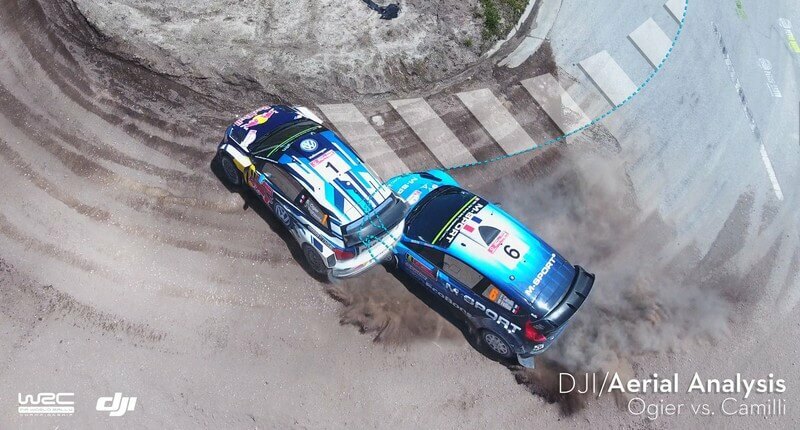 Stay tuned for the full DJI Aerial Analysis of Rally Sardinia that will bring out the finer points of what makes – or breaks – a Championship.